Modern day prophet and hip-hop mega star, T.I. once said: “Life is like a chess move, you need to make your next move.” Though not speaking directly on our beloved game, Mr. Jackson summed up how furious the last two months of the baseball season are. Teams jockey for position like thoroughbreds at Arlington Race Course. Goliaths of baseball like the Astros, Dodgers, and Cubs, used the trade deadline to step up their ernest pursuit of the game’s current best team, the Red Sox. Boston doesn’t want to make things interesting, their seemingly insurmountable lead over the Yankees in the AL East grows each day as the regular season reaches crunch time. Boston figured out most of “it” earlier than most other clubs in the league, earning them the right to brush up on looking down on opponents like Simba in The Lion King. Quite simply, this squad looks bound for late October. The offense is clutch, and Porcello is pitching like a guy who wins Cy Young awards, because he does. Yes, Alex Cora has all the weapons, the depth, and the experience required for a title run; But, the job is just getting started. The first year manager’s club should do well to realize the threats are looming, meaning frivolously disregard the team’s prominence thus far, in the interest of forging their own history. 2018 baseball is different than any year prior because teams are called upon to think about the game in more innovative ways. At one point during spring training, I asked my friend how the hell a guy was going to pitch and hit in the American League? Then, Shohei Ohtani provided an answer. Additionally, and to a measure of controversy, bullpens are now spared in blowouts in favor of positions to do garbage work, (i.e. Anthony Rizzo of the Cubs a couple weeks ago). Speaking of Chicago’s North Side club, Theo Epstein and his Red Sox DNA has the power to thoroughly thwart Boston’s World Series parade arrangements, should the two meet in the Fall Classic. Seeking second half redemption, Yu Darvish hopes to erase “bust” from beside his name. Cole Hamel’s arrival aids in the initiative to remain a serious contender and position the Cubbies to earn their 2nd championship in 3 years. That road passes through Houston, Texas, where veteran pitching and timely hitting has the Astros situated with the 2nd best record in baseball right now. They haven’t beaten anyone 25-4, but they’re damn good, and they want the rest of the league to know it. Unsurprisingly, the defending champs did the least at the trade deadline, and, the moves made won’t pay dividends until we reach the postseason. The clubs on your radar with a legitimate shot should be as follows: Red Sox, Astros, Cubs, Dodgers. That’s it. Sorry Cleveland, you’ve still got Corey Kluber and some nice pieces; but, you still play in what amounts to a minor league division, and a few of your imperative catalysts, like Jason Kipnis, have staggeringly pedestrian numbers this year. I’m never going to persuade you that anything but pitching wins championships; but, you’ve still got to score more runs than your opponent. Come to think of it, something is missing, oh, I know, it’s the Oakland A’s and “Billy Ball” headquarters. They’re scorching hot right now, taking 6 out of their last 7 games, and in the middle of a crucial series with the Dodgers. 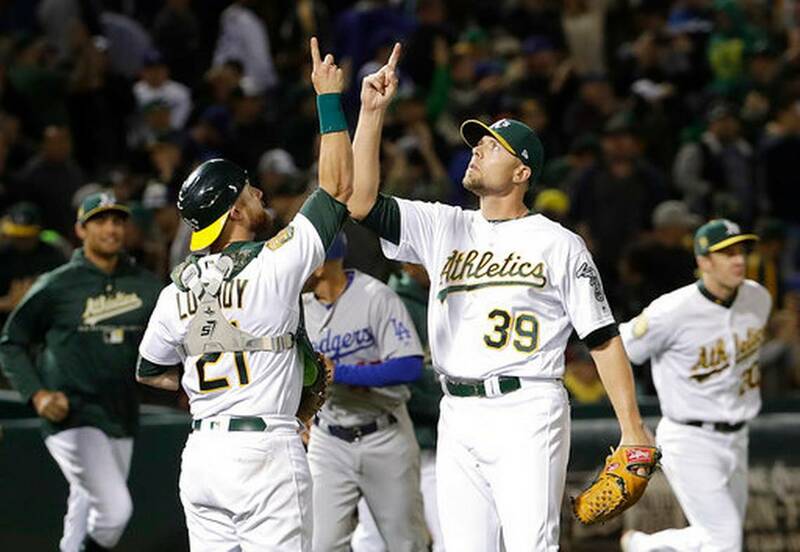 Major League Baseball seems to have a binding contract to make Oakland a fixture in every postseason push. The one element holding them back, however, is their penchant for early exits and scant hardware past the first round. Either way, you best pay attention. That’s where teams like Boston and Chicago hold intangible advantages over any other team seeking the Commissioner’s Trophy. Mookie Betts, J.D. Martinez, Baez, Schwarber, etc., are just better nuanced offensive players with the jewelry to remind themselves they’ve been there before. I don’t know why, but this season feels bigger than most. Favorites from the AL and NL toil away, game after game to win a prize that means more, because, well, there’s more talent than ever taking the field. Each 9-inning game gets you closer to etching your name indelibly into history. So, just as in the third act of a Christopher Nolan film, things are getting good. Every pitch, stolen base, pinch hit, and balk looms larger than ever. Late summer’s best way to cool off, is watching the hottest baseball in town.